Stevia Sweetener – satisfy your sweet tooth the healthy way! Us Brits have become more and more immune to the countless headlines warning of the UK’s growing obesity crisis, with many of us mistakenly believing that it doesn’t affect us at all. Yet, whilst for most of us it’s only too evident when we’ve put on excess weight, others tend to develop fat cells in places where it’s not visible, such as around internal organs and in arteries. Worryingly, this particular type of fat, known as visceral fat, is even more dangerous than the more noticeable subcutaneous fat that we store under our skin. And it’s becoming increasingly evident that visceral fat (and its associated health problems) is directly linked to sugar consumption. Fortunately there are now plenty of ways to satisfy your relentless sweet tooth without having to turn to table sugar or artificial sweeteners (which, incidentally, have been linked to their own set of harmful side effects). These days there’s an exciting range of natural superfood sweeteners available from all good health stores, and stevia sweetener, made from the leaves of the stevia plant, is arguably the finest. But first let’s examine why table sugar is best avoided in the first place. Indeed, a recent study by the University of Bristol suggests that, “high levels of fructose, which may result from eating a diet high in fructose throughout childhood, may lead to an increase in visceral [abdominal] obesity, which is associated with increased cardiometabolic risk”. Cardiometabolic risk is a cluster of risk factors that provide a reliable indication of a patient’s overall risk for Type 2 diabetes and cardiovascular disease (CVD). Another study by the Boston University School of Medicine (funded by a number of US government health institutions) revealed that decreased brain volume was associated with higher BMI, waist-to-hip ratio, visceral fat levels and subcutaneous fat levels in participants aged on average 60 to 67 years. One of reasons scientists believe that excessive visceral fat is so harmful is its location close to the portal vein – a major blood vessel that transports blood from the intestinal area to the liver. Substances released by visceral fat (such as free fatty acids) enter the portal vein and travel to the liver, where they can affect the manufacture of blood lipids. Visceral fat is directly linked to higher total cholesterol and LDL (bad) cholesterol, lower HDL (good) cholesterol, and insulin resistance. Insulin resistance occurs when your body’s muscle and liver cells don’t respond sufficiently to normal levels of insulin – the pancreatic hormone that carries glucose into the body’s cells. This causes blood glucose levels to rise and heightens your risk of diabetes. Although visceral fat can be difficult to detect, research shows that belly size is a strong pointer. According to Harvard University, around 10% of your total fat is likely to be stored as visceral fat, so if you’re carrying higher amounts of body fat than is recommended, it’s likely that you’re also storing more visceral fat than is healthy. Surprisingly, almost nine out of ten of us are blissfully unaware of the health risks related to excess fat around our waistline. The good news is that visceral fat tends to be easier to eliminate than subcutaneous fat – of course, the best way to prevent or remove a build up of internal visceral fat is by enjoying a healthy diet coupled with plenty of regular exercise. And, cutting down on the amount of table sugar that you consume, by switching to a natural sugar alternative, such as stevia sweetener, is an obvious first step. Stevia sweetener is made from the leaves of the stevia rebaudiana – a plant that belongs to the chrysanthemum family and is native to Paraguay and Brazil. Stevia has been enjoyed by the Guaraní people, who used its leaves as a traditional medicine for the treatment of burns and stomach problems and to sweeten yerba maté tea, for centuries. Stevia sweetener comes in both powder and liquid form and contains the ‘sweet’ compounds, stevioside and rebaudioside, which are hundreds of times sweeter than ordinary table sugar. Yet, despite its intensely sweet flavour, stevia sweetener contains zero sugar or carbs, making it an increasingly popular choice with diabetics, as well as those trying to lose weight. Unlike artificial sweeteners, stevia sweetener, which is also known as ‘sweetleaf’ or ‘sugarleaf’, possesses almost no aftertaste and can be used in exactly the same way as table sugar. Why swap table sugar for stevia sweetener? Swapping table sugar for stevia sweetener not only slashes your sucrose/fructose intake and thus decreases your risk of visceral fat accumulation, it may also offer a number of additional health benefits that are explored in more detail below. Stevia sweetener boasts a glycaemic index value of 0, which means that it won’t trigger a rise in blood sugar levels and is thus totally safe for diabetics. In fact, stevia sweetener contains several minerals that actively help to regulate blood sugar levels, including magnesium, chromium, potassium, selenium, niacin, manganese and zinc. And several studies appear to indicate that the steviosides in stevia sweetener improve the function of the hormone, insulin, helping to lower blood sugar levels. As a result, stevia sweetener could prove an extremely useful tool in combatting Type 2 diabetes, which is characterised by elevated blood sugar in the form of insulin resistance or an inability to produce insulin at all. Currently the number of people diagnosed with Type 2 diabetes in the UK is estimated to be around 2.9 million, which represents some 4.5% of the population. The Global Diabetes Community expects that number to rise to a sobering 4 million by 2025. According to the NHS, some 30% of people in England have high blood pressure (hypertension). It’s known as the ‘silent killer’ because it often doesn’t exhibit any obvious symptoms, and if left untreated can increase your risk of heart attack or stroke. Human and animal studies both suggest that the steviosides in stevia sweetener may help to reduce both systolic and diastolic blood pressure and thus help to prevent serious disease. Further research is still required but it seems that steviosides may act by blocking calcium ion channels in cell membranes, a mechanism similar to that displayed by certain drugs commonly prescribed for hypertension. Cholesterol is a fatty substance known as a lipid that’s vital for the normal functioning of your body. It’s predominantly manufactured by your liver but can also be found in certain foods. Having excessively high level of lipids in your blood (hyperlipidaemia) can lead to serious health conditions, such as a narrowing of the arteries (atherosclerosis), heart attack, stroke and mini stroke. Clinical trials on rats have demonstrated that the steviosides in stevia sweetener increase HDL cholesterol levels (the ‘good’ cholesterol that reduces your risk of heart disease) and simultaneously lowers LDL cholesterol (the ‘bad’ cholesterol that collects in the walls of blood vessels leading to atherosclerosis). This causes a corresponding reduction in arterial plaque and may even help to prevent heart disease. 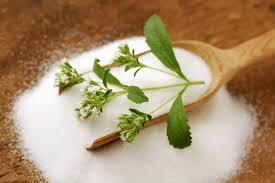 Another often-overlooked benefit of switching from table sugar to stevia sweetener is that it’s kinder to your teeth. As it contains no sugar, stevia sweetener doesn’t provide nourishment for the plaque-forming bacteria in your mouth that can lead to tooth decay and cavities. Stevia sweetener boasts an exceptionally sweet flavour and, especially in pure powder form, has very little aftertaste. Like table sugar it’s readily mixable into most hot and cold, as well as sweet and savoury, drinks and dishes. Try stirring stevia sweetener into herbal teas, smoothies, shakes, juices, and protein drinks for example, or use as a sugar substitute in your favourite (rawfood) recipes, including raw chocolate, cakes and desserts. To help you get started here’s a quick and easy, yet incredibly moreish stevia sweetener recipe for beginners. First peel and de-stone the avocado and cut into small chunks. Next peel the banana and slice. Pop the avocado and banana into your blender and add in the remaining ingredients. Blitz until smooth and creamy and pour into a long tall glass containing plenty of ice. For best results, always choose for a certified organic stevia sweetener that’s 100% pure and free from additives. Never heard of Stevia Sweetener but I’ll definitely be giving it a go now! Hello, we can supply stevia extract & Erythritol with good quality and competitive price. If you are interested in it. Please contact me freely!